The 4-foot horn was introduced in 1931 when Voigt was working at Edison Bell. It was designed primarily for use in cinemas and large halls, where efficiency and quality were important. The ingenious design made dismantling the horn very easy, and allowed it to be stored in a relatively small space. The diaphragm of the drive unit was loaded down to 128 Hz. The cut-off frequency however was not abrupt as the response rolled off gently below this frequency. Voigt produced a version of this horn with a bass chamber incorporated to extend the bass frequency response. 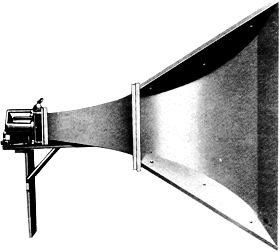 A smaller 2-foot horn was also produced for use in public address systems. The cut-off frequency of this smaller horn was 250 Hz. In 1936, the price of the 4-foot horn was £8-0s-0d. The 2-foot horn retailed for £3-10s-0d.